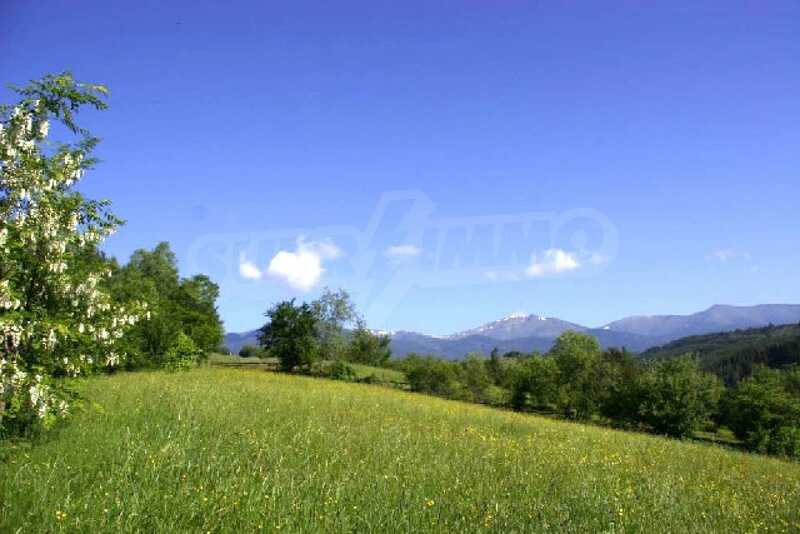 Chalet for sale near Bansko, Bulgaria. 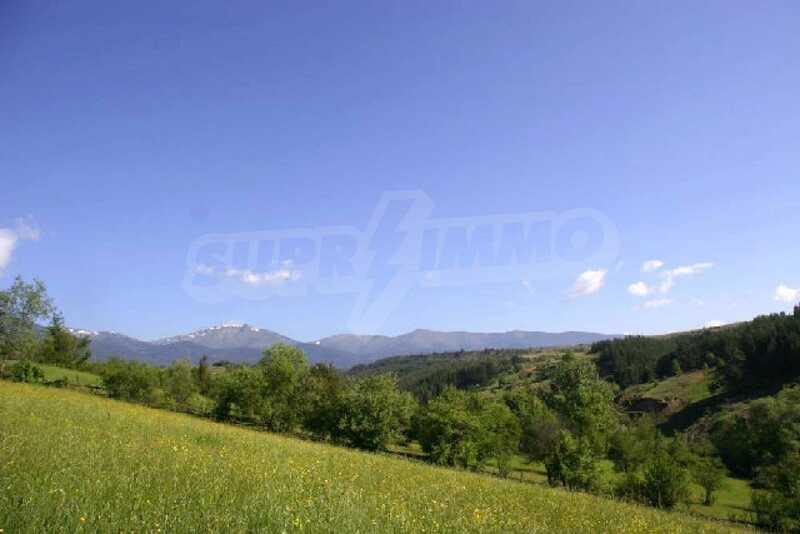 New villas with uniqie views in clean region, 14 km away from the ski runs of Bansko. Chalets MontBrillant, near Bansko and Razlog. 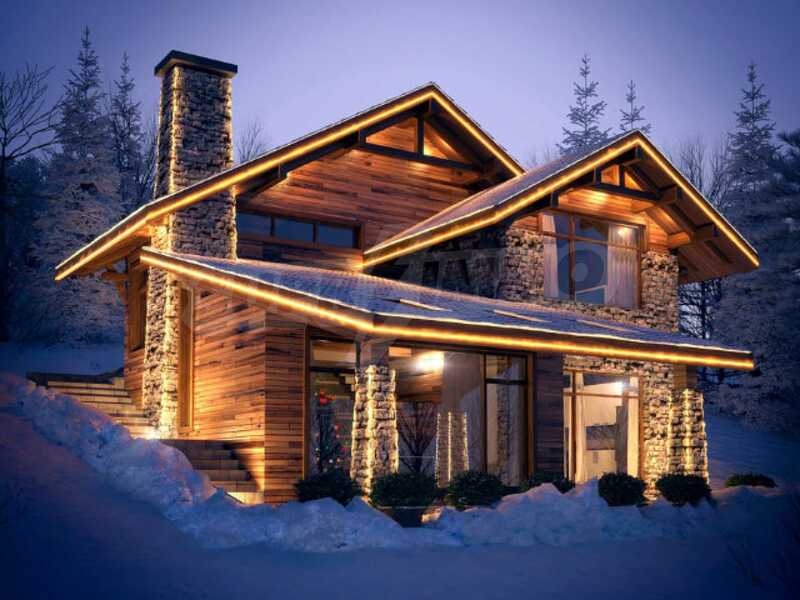 THESE MOUNTAIN HOUSES CAN ALSO BE BUILT ON A PLOT OF THE CLIENT IN ANY LOCATION AROUND THE COUNTRY. ALL CONSTRUCTION AND ARCHITECTURAL CHANGES CAN BE MADE AS PER THE CLIENT'S WISHES. 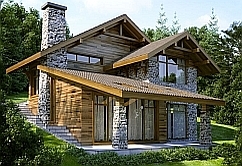 The Chalets Montbrilliant gated development is a holiday village consisting of 8 chalets designed in a modern Alpine style. 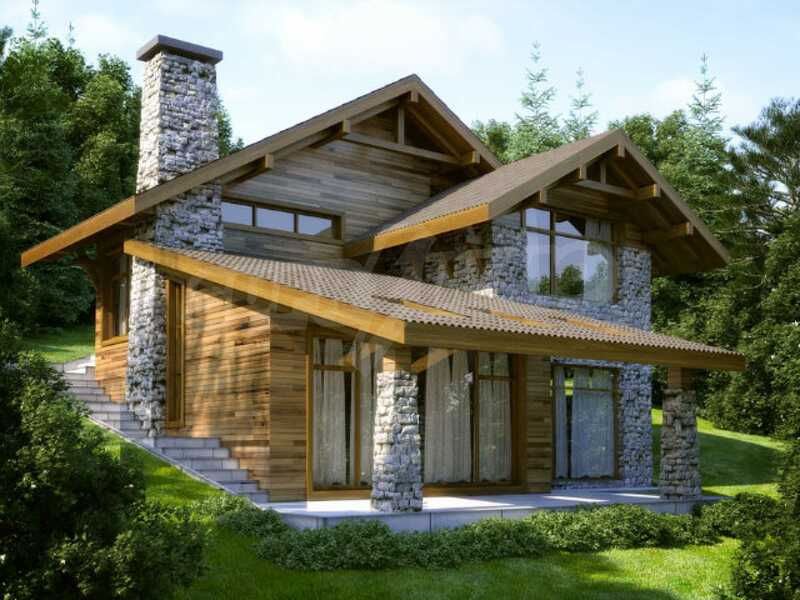 This is a project giving you the desired relaxation in the mountain – small family houses set on a sunny southeastern slope governing panoramic views to the mountain. The plot on which the holiday village will be built is regulated. 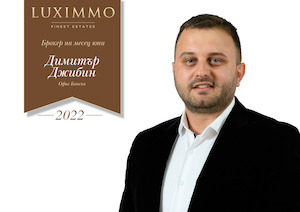 Its area is 3,245 sq.m., it is located on a high hill at the end of the charming village of Godlevo (near Razlog), only 14 km from Bulgaria’s biggest ski resort – Bansko. 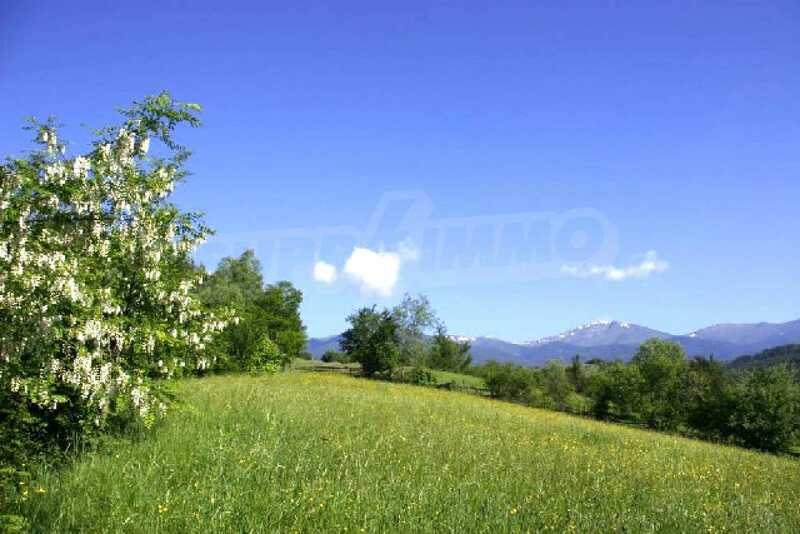 The access to the plot is fast and easy – along a well maintained asphalt road which is accessible even in winter. 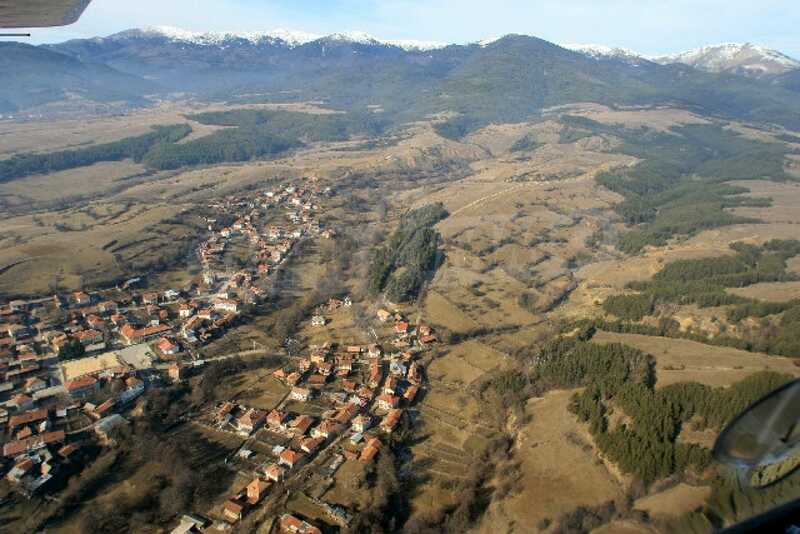 The area of the village of Godlevo is surrounded by rolling hills with pine forests, pastures with lush grass and meadows with fragrant herbs. 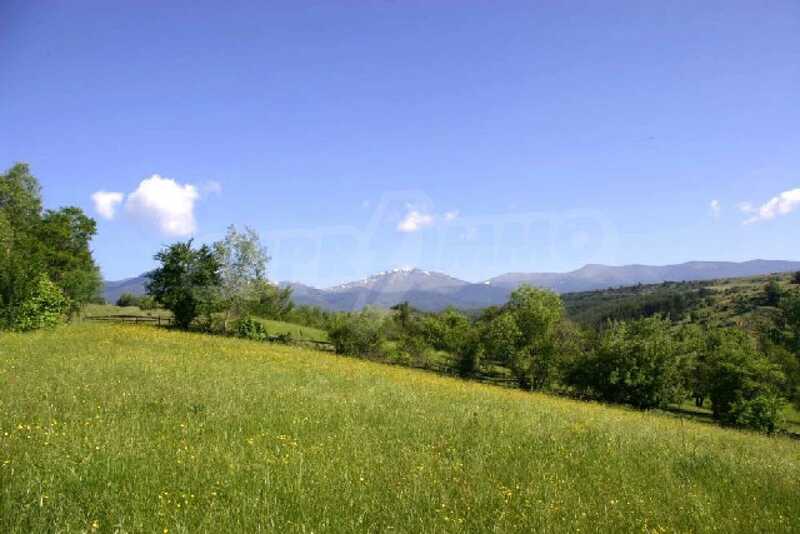 The plot of the holiday village commands wonderful views to the peaks of Pirin and Rila mountains. 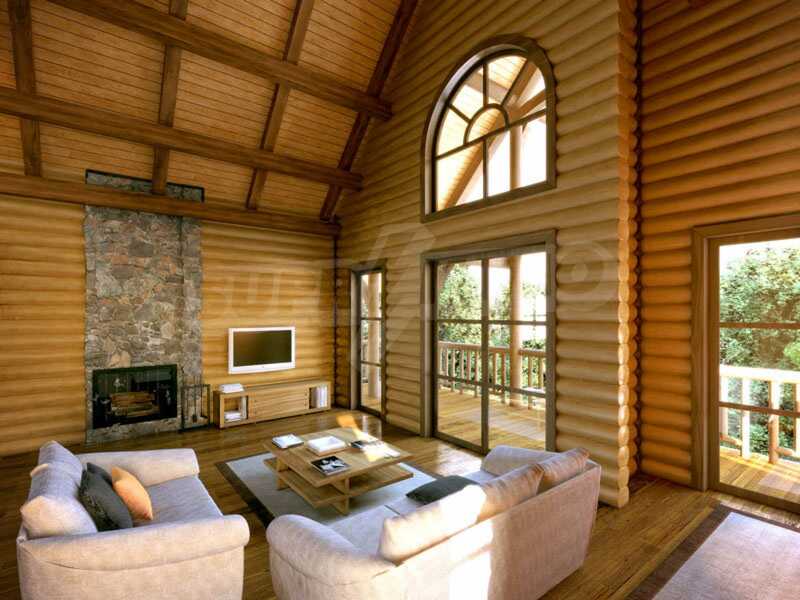 • is a Finnish-type villa – built with natural hand carved cylindrical logs and with insulation, on three levels. Villa Mont has a sauna and a billiards room which has access to a panoramic terrace. 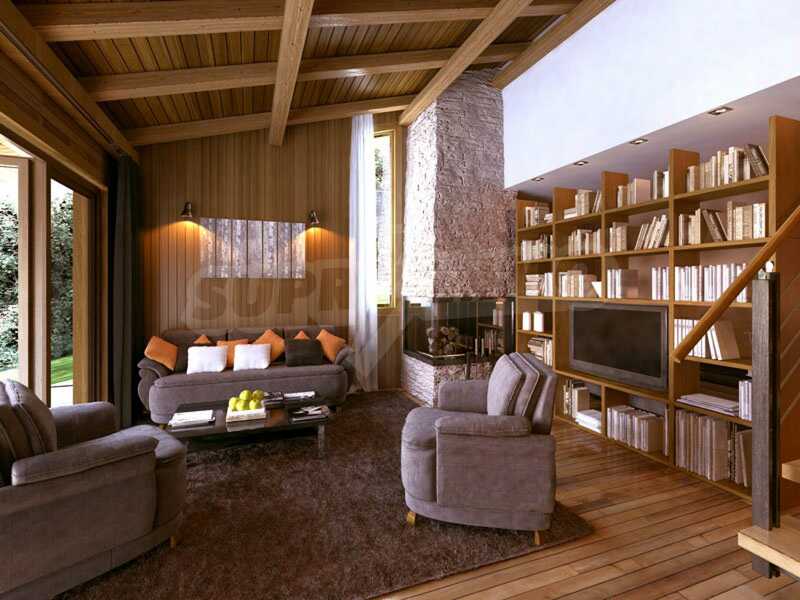 • is a chalet with massive construction, insulation and stone and wood facing, on two levels. 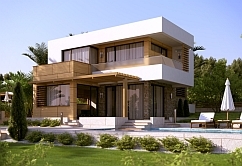 Each of the eight villas is situated on a separate plot of land whose area varies from 326 to 448 sq.m. The plots are connected to each other via alleys, as each plot has direct access to an asphalt road. Every plot has a parking space. If the client wishes a roof can be built over the parking space which will be in unison with the architecture and the materials used for the villas and will protect the car from the snow and the sun. 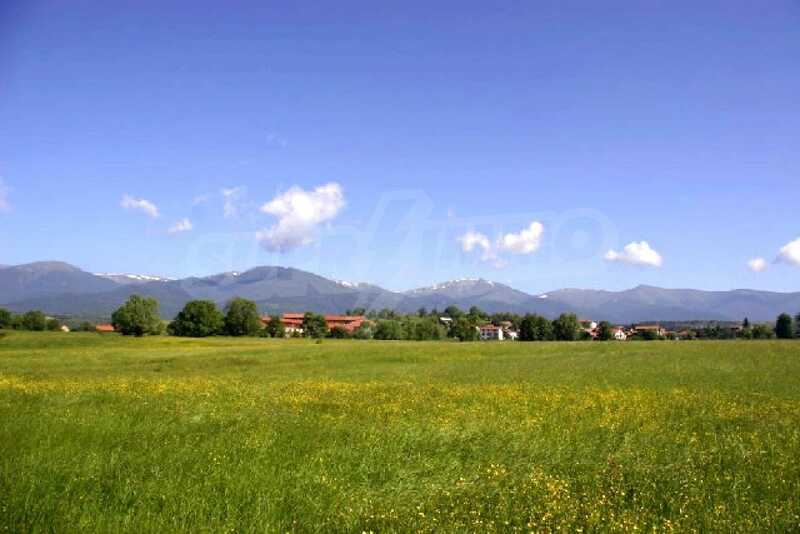 The plot of land where the development is located is sunny as it is set on a southeastern slope and it commands a wonderful panoramic view. 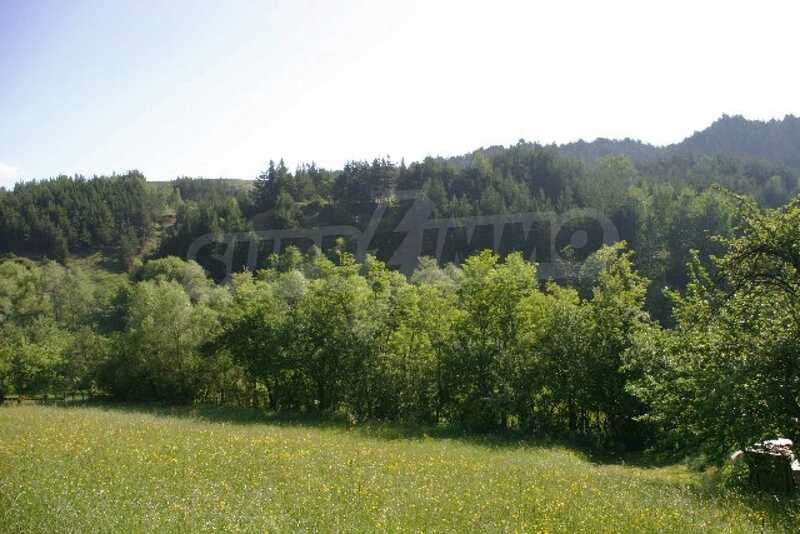 The plot is terraced which means all houses will have great views to the mountain, the surrounding slopes and forests. The houses in this project are luxurious in a way that will remain unchanged through the years and this allows the houses to change without disturbing their overall concept and harmony. They follow the newest trends in interior and exterior design but at the same time they keep the potential to change in time. The houses we offer you are flexible and adaptable – their rooms can easily be altered, transformed and modernized when you decide you want some change in your second home. At an attractive price we are offering you quality construction with natural durable materials, functional layout of the interior spaces, elegant comfort, coziness, good ventilation and lighting in the rooms. 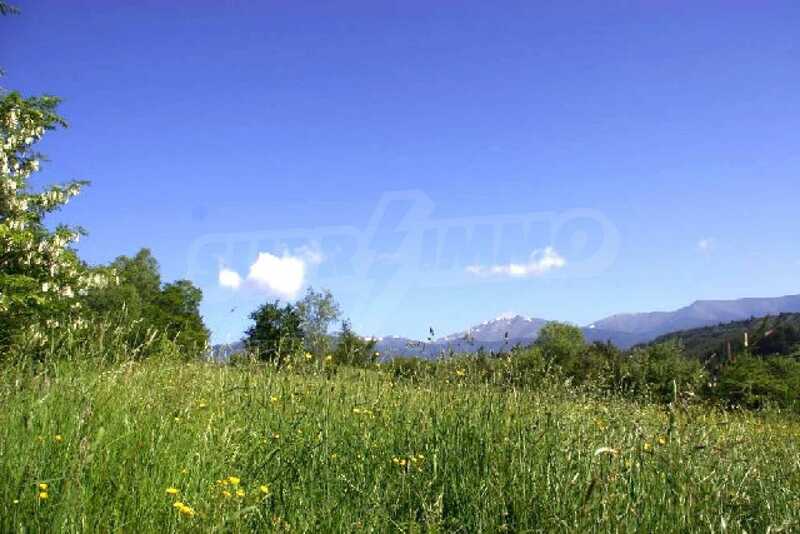 With this project we have created the perfect conditions for your dream mountain holiday in a healthy environment. And last but not least, both types of houses are very energy efficient and easy to maintain so the costs for their upkeep, heating and ventilation are reduced to a minimum. 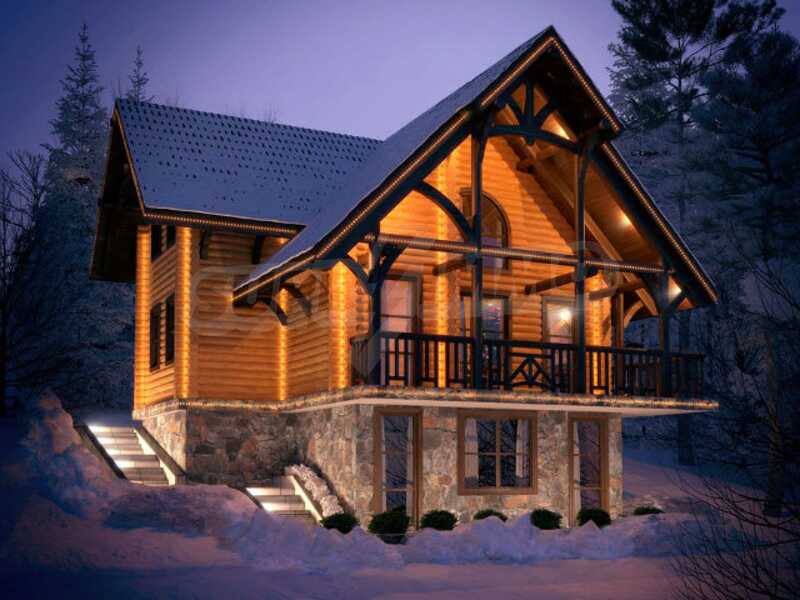 By investing in a chalet in the Chalets Montbrilliant development you get much more than a place to relax. You get security that you are investing in something lasting which even decades later will retain its stability and value – both in terms of the quality of the materials used, the architecture and the location. The goal of the project is to interpret the trend of natural lifestyle in energy efficient houses. The concept of the project puts forward the ergonomics which is a main prerequisite for achieving a cozy and comfortable environment. The rooms are designed in such a way so as to maintain the internal microclimate and to provide comfort to the inhabitants. Everything said so far can be recapped in Chalets Montbrilliant’s main concept – elegant luxury, esthetics of natural materials and intelligent solutions on every level – from stability, energy efficiency and functionality to attention to each piece of furniture and to the smallest detail in the interior. Investing in such a property will only add to your lifestyle. It will give you a place to escape from the daily life in the city – a place to relax with family and friends, a place to create memories. This is the place where you can bring up your children to love purity, natural harmony, space and freedom. Everything is calm here, with untouched nature and animals living in their natural habitat. Here your children may see for the first time a squirrel, a hare or even a molehill. If you are strolling in the nearby forests show your children the blackberry bushes and the interesting mushrooms; show them the grand ant-hills which the hard-working ants have been building for years. The buzzing you will hear is the buzzing of the bees gathering the honey dew around the lush meadows. And in winter… In winter, especially around Christmas, the wonderful houses of the Montbrilliant holiday village will definitely be the first to attract Santa’s sleigh and all the presents. Most of all Santa loves houses with chimneys and fireplaces with cozy and warm rooms – just like your living room, so your stockings will be the first to be filled. 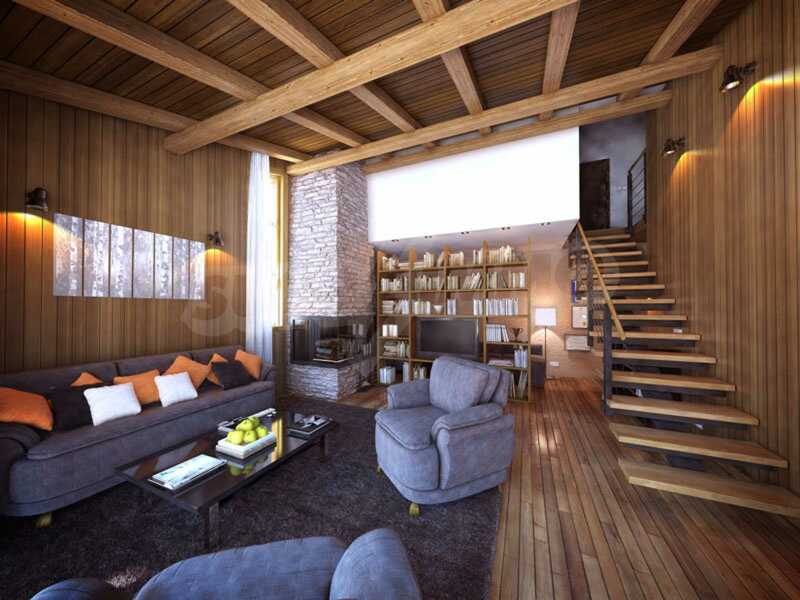 After a day on the snowy slopes of Bansko you can put your feet up and relax in your house. The fire will warm you and make you feel sleepy so you will meet the new day refreshed – ready for new adventures on the white slopes. The main concept of the project is to recreate the warmth, coziness, comfort and healthy environment of times past when people used only natural materials in their homes. In those times people drew their energy and strength from nature. Everything in their daily life was based on the simplicity of natural materials. The advantage of the houses in this project is in their charge - the charge of the natural materials used. 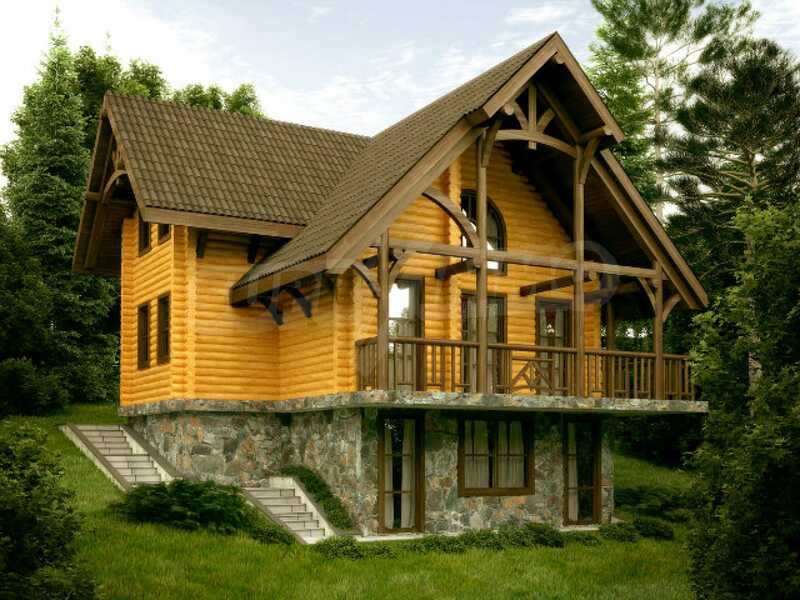 The idea is the houses to give natural energy and strength to its inhabitants and guests. Each of their elements emanates harmony, coziness and warmth which are conveyed to the inhabitants. The main concept when designing the houses was to create a unique environment that would heal the inhabitants and would restore their natural energy. Here, among unspoiled nature and crystal clean air and in a house that follows nature’s laws, you will recuperate from the busy and stressful daily life of the big city. Here, submerged in the aroma of the morning dew and the scent of the grass in summer or in the magical whiteness of the snow in winter you will feel your strength returning and your senses will feast on the pure strength and energy. When a person is healthy they enjoy life much more so in these natural surroundings, which we will create for you, both your body and spirit will feel much better. After a holiday in those wonderful villas you will be ready to face the new challenges and you will know there is a place you can come back to regain your strength and vitality. The healthy atmosphere in the houses is due not only to the high quality natural materials used for their construction but also partly to the comfort of the rooms and the good internal layout. Here the light and the natural ventilation are conformable to the needs of the inhabitants. There are no unnecessary acute angles and edges; everything looks as if it is floating – the staircases are of light metal construction but with solid wood steps, the windows are large and let enough natural light. There are no large corridors in both types of houses as they are as small as possible so that the actual living spaces are larger. The houses we offer you are comfortable and functional and they provide relaxed and cozy living. The houses have a stable and durable construction but at the same time the internal spaces are spacious, light and airy. The rooms are spacious and roomy. Another advantage of the villas is that in time they can easily change to follow the fashion in interior design and the heating and maintenance novelties. We know that in order for a person to feel well they need natural light. During the long summer days we feel great, we are more optimistic and carefree. The windows of our villas are large and offer panoramic views – thus the internal spaces are optically enhanced and by opening the windows you let the nature step into your home. The natural light enters through the large windows and brings the feeling of happiness and vitality. When the days are short and winter sets in the whiteness of the snow reflects the light of the day and the night. The large windows allow the light of the short days and the moon rays, reflected and multiplied by the white snow, to enter the villas. In our project all spaces are used as best as possible and the inhabitants are offered comfort and wellbeing – optimal air temperature, natural ventilation, and enough light during the different seasons. In winter the fireplace and the eco pellet heating system generate warmth and comfort and the windows are placed in such a way so that if needed the air can circulate around the rooms to bring freshness. 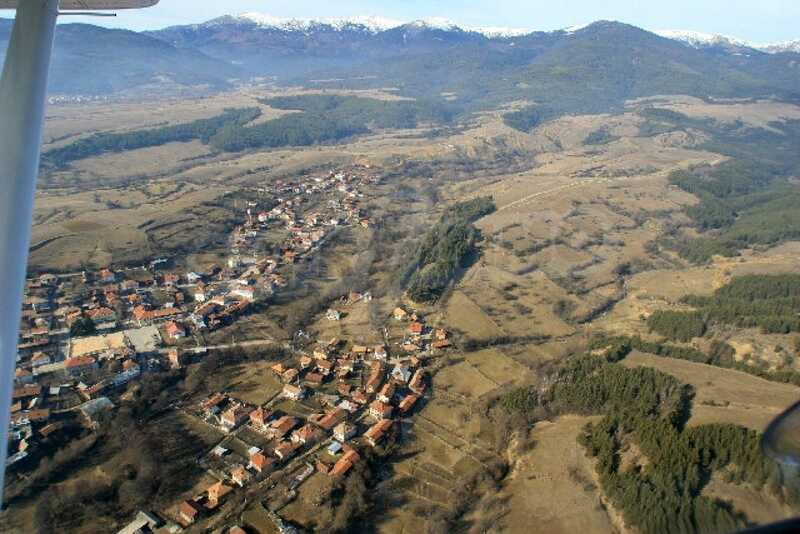 And last but not least, the area of the village of Godlevo is ecologically clean and that is why this is the place we chose for you – without the fine dust of the large city and the noise pollution of the traffic, without the constant buzz of the antennas. Each of the villas Mont and Brilliant can be built on a plot of your choice. For more information, please contact your agent for this offer.